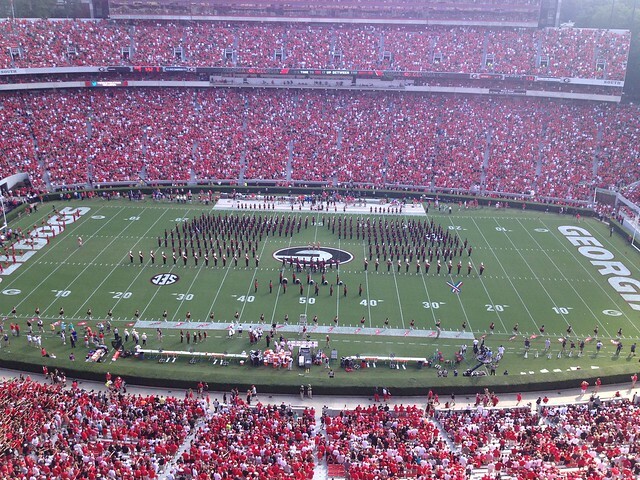 I so wanted to come to this space and taunt Gamecock fans (read: all of my family and many of my friends) about last weekend's oh-so-sweet victory in Athens. And after having witnessed, in person surrounded by South Carolina fans, last year's 35-7 Georgia beat down and hearing "Sandstorm" no less than 1000 times, I think I deserve to relish this year's win. Maribeth and I sneaking into the student's section and being mistaken for students. It happened. It happened because we left our real seats in the visitors' section. I thought it was an easy place to retreat from the Gamecocks we'd been sitting with. 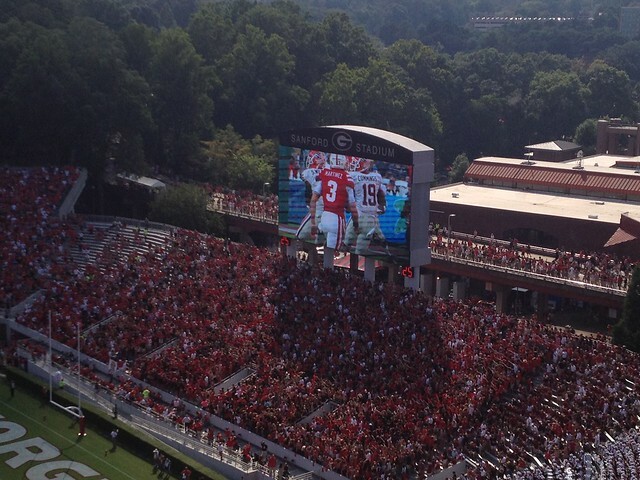 When I was in college, I don't remember the students' section being, in any way, a coveted place to sit. I remember it more of a wasteland, free-for-all where anyone and everyone could come and go as they pleased. Those days are gone - and students are required to now show their tickets and/or student IDs to get into their seats. Stadium security guy asked me for my ticket as I walked purposefully towards the 300 section. I fibbed and said I lost it. Then he asked me if I had my student ID. "Oh, that's sweet of you to say," I said, "But I haven't been a student here for 10 years." I guess he respected my honesty, because after a couple of side-eye glances, and me fake pretending to dig through my purse to find the lost ticket, he let us into Section 310, where we climbed to the top and found an open place on an aisle to set up camp for the second-half. 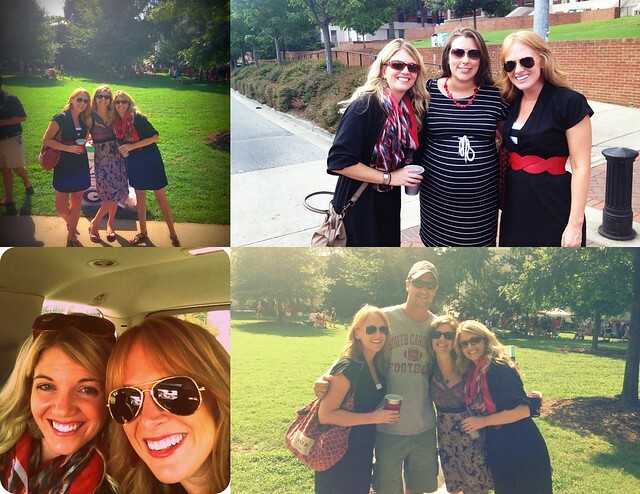 The young energy and endless chants, the familiar smell of Beam and Coke, the trendy outfits (including stickers that read "Phi Mu loves the Dawgs" and "Theta Loves UGA") - the whole scene was just so college. I suppose maybe I should've felt old and a little silly, but I felt right at home. Then, almost as if it was meant to be - I looked down to find a sticker that said, "5th Years Love Georgia," as in those students (like me) who managed to squeeze an extra fall semester, making them "5th year Seniors." I peeled it off the aluminum seat and didn't take it off for the rest of the night. 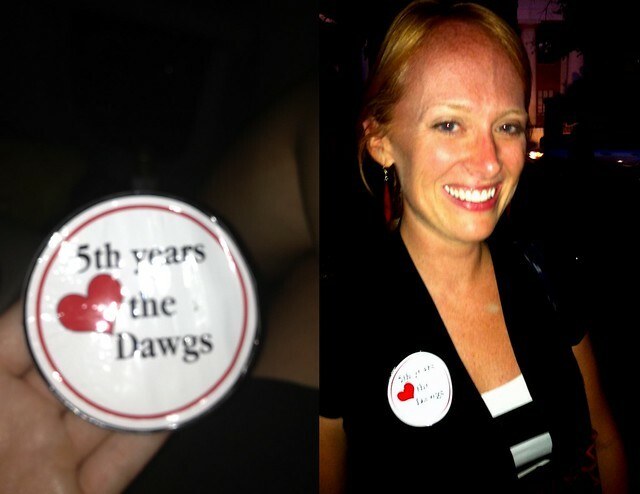 Ok, so maybe it would've been more accurate had it read, "15th Years Love the Dawgs," but I didn't care. Then, a guy who must've been fraternity pledge (evident by the white button down shirt and tie he was wearing in the 90 degree heat), but who looked no older than 13, turned around to tell us something that had we been current students, we probably would've understood. I shook my head sheepishly and confessed, "Um, this is embarrassing, but we actually already graduated a while ago. We're not students anymore." "So what are you, like 24 or 25?," he asked earnestly. "Well . . . something like that," I replied, "Only more like 32." He and his date, a petite blonde with a temporary "G" tattoo on her arm seemed genuinely shocked that we were that old. If it wasn't possibly illegal and definitely creepy, I might've reached over and kissed the little guy. The little college freshman. This experience, the day, the victory, it all felt very old-school Georgia. Very vintage. Very perfect.